Home » Blog » What’s Eating Us? In trying to explain the contemporary state of American politics, one characterized by a revolt of the voters against the established political parties, we’ve tested a couple of hypotheses and found each wanting. A first thesis localized the problem to just one side of the political spectrum (the Right, where Republican primary voters have anointed an insurgent as their Presidential standard bearer), but this explanation fell down when we took into account a similar dynamic unfolding within Democratic ranks (one that has only grown stronger in the last two weeks). A second hypothesis moved us along a bit further by explaining the current state of affairs as symptomatic of public anxiety. But this explanation’s focus on voters’ economic anxiety failed to explain why rebellion does not seem to correlate with the economic desperation, given that many of those revolting against the parties are on higher rungs of the economic ladder. Expanding “anxiety” to include non-economic factors, such as fear of a deteriorating state of the world, could help shore up our “Anxiety Thesis.” But for those of us who grew up under the shadow of the nuclear rivalry between the US and USSR, that experience highlights how deep and even existential concern over international affairs can lead to a strengthening of support for civic institutions (such as political parties), rather than hostility towards them. Rather than search broadly for more abstract contributors to our current mental state, perhaps we should narrow our search to factors that might bear specifically on current political events. To do so, I’d like to draw on what I learned during my One Year BA on the evolution of the nation’s self-understanding. 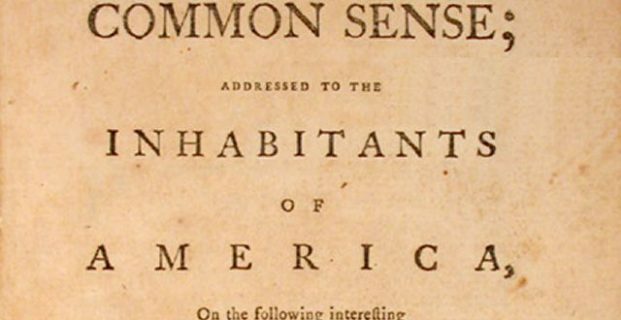 In the beginning of American politics, there was not “Left” or “Right” but Common Sense, specifically, a philosophy that believed the organizing principle for the nation should be the small community which could solve any problem (up to and including scientific discovery) through citizens working together jury-style to arrive at the truth. As the nation became bigger and the world more complex, the notion that a handful of non-specialists could deal with any issue became less tenable, if not downright quaint. Modernity, after all, requires experts working within large (sometimes faceless) entities to generate our power, manage our airlines and keep the Internet up 24/7. But even as we enjoy (and take for granted) a bounty unheard of in human history, every time we fill up a shopping cart with food manufactured by people we will never meet we feel a small tug of anxiety as living in a Common Sense recedes not just into the past but into the realm of impossibility. Anxiety over this loss manifests itself across what we claim to be a political spectrum of polar opposites. But when liberals rail against “Big Corporations” and conservatives condemn “Big Government,” should we be focusing on the nouns in those phrases or the common adjective “Big?” For “Big” invokes distant impersonal entities that know much more about us than we know about them. And if you look at what those who attack “mainstream” Republicans and Democrats are saying, they seem to see the parties as having joined the ranks of the big, mysterious entities trying to control us. Might such a sentiment be rational? After all, election politics now begins not with crafting of policy or discussion with voters but with recruitment of experts – pollsters, strategists, speech writers, statisticians, etc. – who all claim to know we voters so well that they can craft a campaign based on taking our votes (and us) for granted. So might today’s crisis within the parties represent “We the people” refusing to behave in ways these expensive specialists say we must? Of course, “We the people” are not entirely off the hook. After all, it is we who have organized ourselves into communities of the like-minded who think and vote in ways that seemed to make us easy to predict (and manipulate). And is rebelling by voting for candidates who might not be experienced or even appropriate for the job of President a rational response to feelings of disempowerment? I recently found a blog post mentioned in Critical Voter which describes the kind of anxiety which derives from discovering that a stability we believe we have achieved might be a mirage. The piece comes from a site focused on the war on terror, so you should use your critical thinking skills to control for bias. But even after taking that into account, I think this analysis might get us closer to understanding what is really going on as the unexpected – the norm throughout human history – begins to reassert itself in an age when we thought we had everything under control.